Our Rotogola Unique Features show case the best styles for your home and environment. 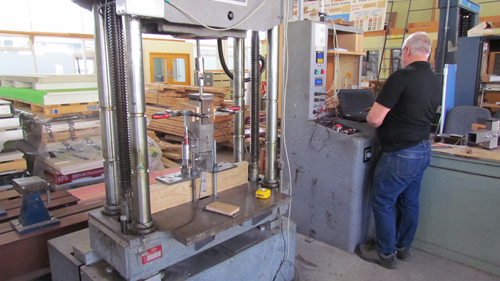 Our World First clamping design is so innovative that we had a specially designed machine manufactured to form our special Patent Pending and Design Pending profiled bearer beams. These beams can be manufactured curved or straight depending on your taste. 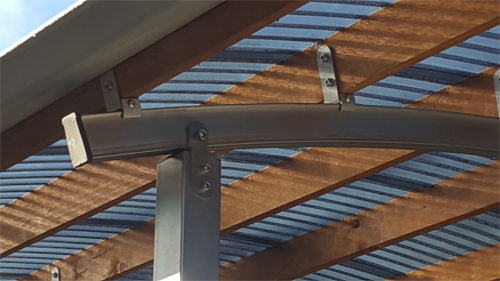 The innovative clamping bracket design using only Stainless Steel components allows for a quick and simple way of placing brackets for the timber rafters on site positioned where ever the customer or builder likes with ease at time of erection of your Rotogola Elite Shelter thus making it so simple to erect a product that looks as though only a commercial building company could build! 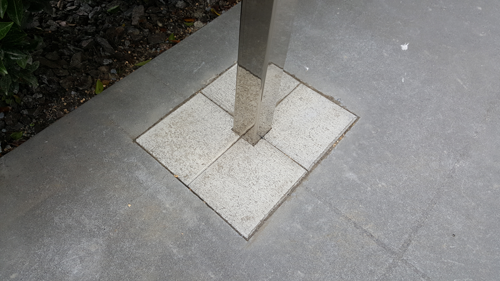 The foundations for our stainless steel box section pillars are engineer designed to stand the test of time and high wind situations using stainless rods to secure the base to the encased concrete. 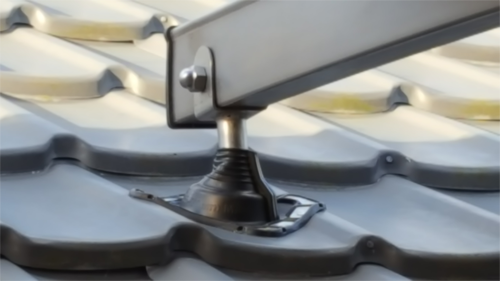 Rotogola Roof Brackets are a one of a kind that don’t attach underneath your eaves where there is often little strength for attachment but rather go through your roof and mount directly to the top plate of your wall framing and also bolt right through the side of your roof rafters, giving far superior strength and with the height factor a far bigger feeling of space when standing underneath. This system also creates great air flow on those hot summer days. Living by the sea or in a harsh environment or you simply want a total look of Class and Quality? then look no further than the High Quality and low maintenance that 316 Stainless Steel will give you. Peace of mind comes with our 3mm wall Stainless Steel products. 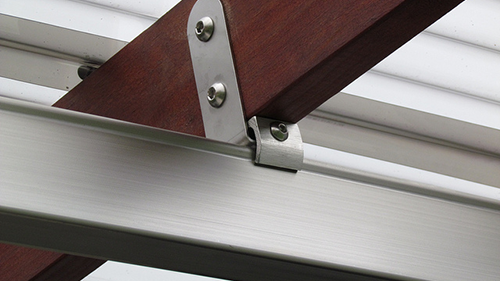 We do not settle for less than the Strength and Durability that 316 Stainless Steel gives you the customer! All bolts are visually appealing Allen Key head Stainless Steel coupled with none other than the great look of Total Quality that Stainless Steel dome nuts add to a Class finish. We believe that New Zealand still demands that complimentary element of the beautiful warm timber look to be coupled with the lasting Quality of Stainless Steel. 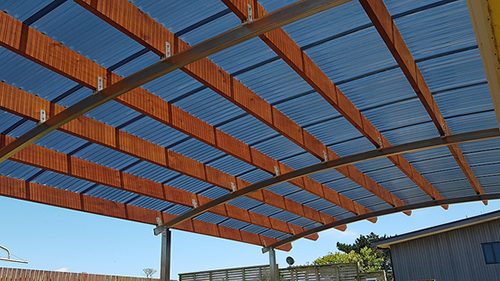 All of our rafters are none other than H3.2, SG8 treated Kiln Dried NZ Native timber for that lasting durability you can expect for NZ’s harsh changing environments. Special laminated options can also be organized for those different situations that may want this as an option? These can be stained or painted to a colour of your choice to individualize your Rotogola Elite Shelter. Our Unique one of a kind Rotogola Patent pending bracket system has been independently, Scientifically Tested to prove each individual Rotogola bracket can withstand up to 700kg of uplift to give you peace of mind of the superior strength our Patent Pending System has over other alternatives on the marketplace.